I just found out the forum was changed, and surprisingly there is no introducing thread. I'm sure many people remember me if you were active within the community over the years. I started S4 League in March 2009, and the game quickly become a very important aspect of my life. I was one of the freelance lead event co-coordinators of S4 for many years after it launched, and most recently lead Game Sage for EN at aeria games. I've been gone over a year now, as I felt it was a good time to move on. However despite that, I've never forgotten the memories and the moments I shared with everyone I came in contact with. I still miss the game every day, and it brings a smile to my face to see some old players still at it in the net sphere. It would be great to be able to catch up with people, and maybe even play a couple of matches. See you guys around in the near future! Let's hear more about everyone else. Over to you, ya'll. It is all in my profile. Good to know you aren't dead. Wb. Yeah, my info is there. 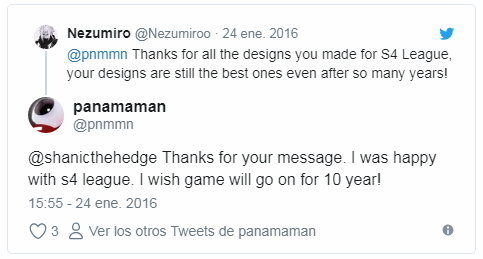 I remember you from Twitch nice times. My name here is B3mo. I was a active member in the old forum but not as active as some people around here. I started playing S4 League in the open beta phase. Other games that I have also played (published by Aeria Games/Gamigo) are Aura Kingdom and Echo of Soul, but S4 League is the only one I'm still playing after all this years if I feel like it. Sorry for my english I'm austrian. but i am just a trap. Just a long time forum shitposter since Alaplaya. I don't play this game anymore, just come to troll. Well many here do not know me, and sincerely I know very few and if I know 4 is a lot, play a time, a long time in the European S4, then I had to play in the S4 Latino. But I really love the forums and share in them. I miss this old times. ohh i can't remember this forum. But it looks pretty simple. I think S4 League had like 5 forums. There would be more now as well if the forum wasn't the last place where the official news are announced. Well, a forum is a forum, the structure will always be the same. But I really liked that old forum. Meh, maybe i'm old for this new generation. And also I wasn't a forum user, I went to the forum when I had a problem. Now I see how much fun it is to be part of the forum. I am not even sure which one is older, alaplaya's or the previous aeria forum. I actually registered aeria account 2-3 days before making alaplaya account. I don't remember what game I was planning to play on aeria but I surely stuck with s4 in alaplaya. What can I say? I just gained interest through my friends. Now i'm just a wandering spirit in the game. I can prepare you a cocktail tho. An unknown person that does not want to be known. Only few unlucky people got to know me well. However playing s4 since 2012 and now just waiting for its end. Hello to new and old im simonmana a craptastic kpop trash person reviving from the dead because i was updating all of my account emails.Should you choose to nuke me like Kim Jong Un you will need to target Bulgaria in Eastern Europe.I use dark mode since im no pleb and i main twin daggers , sentry turret and mind shock because i can. Hai everyone, It's me!! Remember me? The WHAM goddess? The cannonade queen.?! Anyone? Thank you.At least these forums look nice. Cannonade queen?Yeah think i member. Hello, apparently I am mysterious so I wanted to introduce myself. my name is Avi aka oPunk, well, I am not a punk in real life actually but I used this name because I thought it looked cool. I am planning someday to get the name Punk or Star. I started playing this game a week after it came out, I cannot explain how much this game added to my life. I started with the name ''Mr.Insane..'' I was really good back then and I even managed to join a custom clan mark clan who used to be really good unlike nowadays ccm's. The clan is called Insâne, unfortunately, it's bugged at the moment so no one can join it anymore. In 2014 I created my new account because I couldn't use my previous one for a private reason. but yeah, I created oPunk. I am now a level 80 aka S4. I am a Staff member of the biggest Discord server. In 2 years I will be joining the military. I am really friendly, so no need to be shy to say hello. Started playing this game around November 2009 during the first Halloween event, I started playing S4 League more often in the summer of 2010 when we had an event where we had to gain alot of EXP to get permanent Summer Sets (I think it was the Pineapple, Jazz Butterfly and Diamond ones? Was that 2010? ), didn't get it. I'm not really new to the forums, I always roamed around, posted here and there, ranted in alot of threads, just used the forums to participate in forum events to get free stuff because I'm cheap. I casually play S4 League because I don't have the time atm, currently a Fashion student which is funny because one of my influences for my carreer option was because I wanted to design sets for S4 League. I've always wanted to be more active here but it never happened. TL;DR: I only come here for event participation pen.